Pervasive Developmental Disorder, Not Otherwise Specified (PDD-NOS) is a 'sub-threshold' condition in which some - but not all - features of autism or another explicitly identified Pervasive Developmental Disorder are identified. 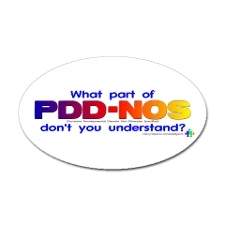 PDD-NOS is often incorrectly referred to as simply "PDD." The term PDD refers to the class of conditions to which autism belongs. 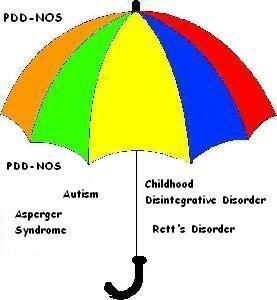 PDD is NOT itself a diagnosis, while PDD-NOS IS a diagnosis. The term Pervasive Developmental Disorder - Not Otherwise Specified (PDD-NOS; also referred to as "atypical personality development," "atypical PDD," or "atypical autism") is included in DSM-IV to encompass cases where there is marked impairment of social interaction, communication, and/or stereotyped behavior patterns or interest, but when full features for autism or another explicitly defined PDD are not met. 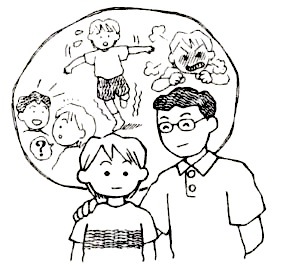 - autistic behavior, difficulty making contact. - loner, feels themselves a stranger in the world. - intellectually they are often normal to even bright. - obsessive behavior or tendencies. Many of these features can be found in the Lanthanides too. The autistic tendency in the Lanthanides can be quite strong. The theme of the inner world is central, living in their own world and having difficulty coming out. This is connected to the fact that the Lanthanides all are of a quality of Stage 3, being before Hafnium. So they don't know what to do, what to decide, or how to give themselves a form in this world. They can feel as someone not fitting into this world. This feeling of being a stranger is often enhanced by the fact that they are sensitive. So they feel what others intentions and feelings are, but that doesn't fit with what they say and express, so they get confused. Confusion being a strong them for Stage 3. Or they feel strange because they have feelings and ideas that others don't express, especially in the field of taboos. So they start to think that they must be weird that they have sexual feeling or anger, or strange ideas. And their ideas are often "weird" for the outside world as they tend to be very bright. Obsessive behavior is also a typical expression of the Lanthanides. It is arising from the desire to control, to control themselves. They want to go their own way. And that makes contact more difficult, as others always like to influence them. It gives problems at school where they have to behave as the teacher wants them to. Their desire for freedom gives rise to problems even more when they are not an adult, when they told what to do and not allowed to decide for themselves, retiring into their own world is a solution for that problem. From this it may be clear that lanthanides are often indicated in PDD-NOS. This is the experience in our clinic, the Homeopathisch Artsencentrum Utrecht. The following two cases are examples.